The NBAA Safety Committee successfully executed its leadership transition plan during the annual Business Aviation Convention & Exhibition (BACE) held recently in Orlando. Hope Aviation’s Eric Barfield joined the Safety Committee in 2002 and was asked to be a part of the leadership team in 2008. He then succeeded HP Aviation Director Rich Walsh as chair in 2012 and has now passed the torch to Altria’s Steve Charbonneau. Dave Ryan of MedImpact steps up to serve as Vice Chair and Global Aerospace’s Marilena Sharpell joins the leadership team as Secretary. Podcast: Task Saturation – How Much is Too Much? 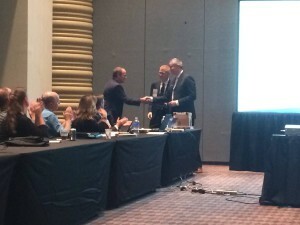 Eric Barfield is recognized for his years of service to the NBAA Safety Committee. Hope Aviation Newsletter is a quarterly publication to keep you up-to-date with the latest news and developments in the Aviation Insurance Industry.